NOR gates have two bits of input and a single bit of output. 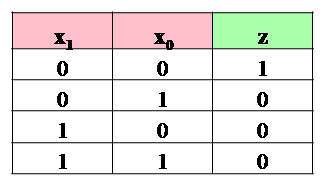 The output of NOR gate is the negation of OR gate. The truth table defines the behavior of this gate. The function is symmetric. Thus, x NOR y == y NOR x. This can be verified by using truth tables. The function is not associative. This can be verified by using truth tables. Because of these properties, NORk is defined from ORk and NOT built from NOR gates.